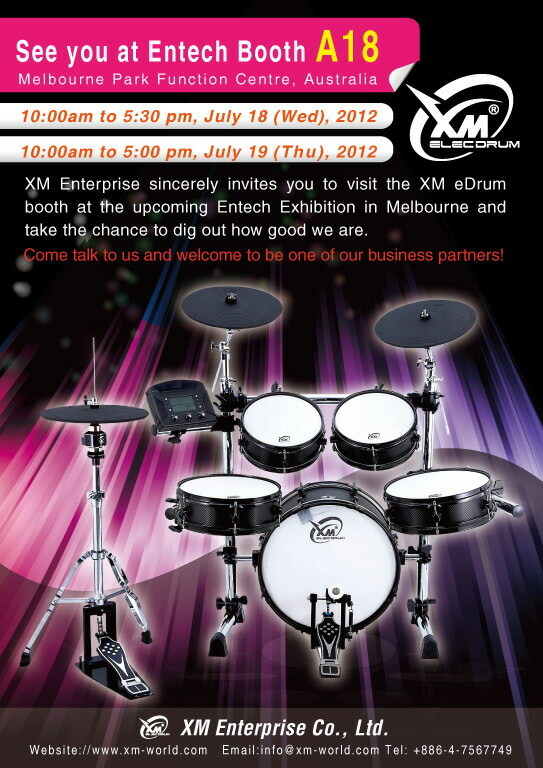 XM will take part in Melbourne Entech Exhibition in Australia this July, come to our booth# A18 and give it a hit! A blue version of the XM Tempo Series T-5SR eDrum kit. 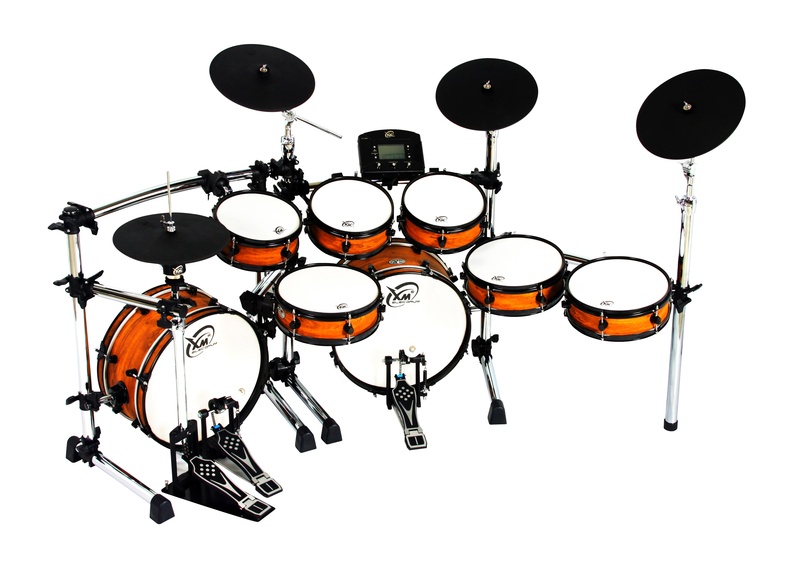 As of the end of the year 2011, the C-MAX-9SR is the top of line when it comes to e-Drum sets around the world. 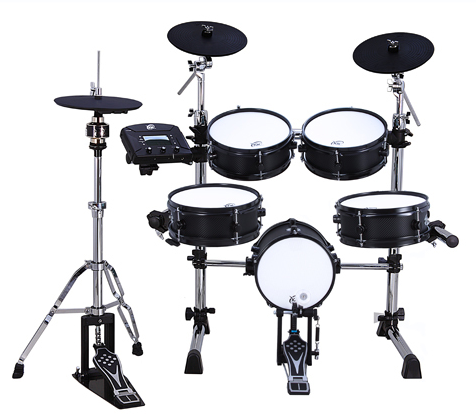 This XM World e-Drum kit is made especially for experts who desire an elaborate electronic drum set with the maximum number of drums and cymbals. The optimum number of triggers is used on each instrument to create the most sounds possible. The result is the most realistic digital drum set in the world today. The XM Master Series C-MAX-9SR comes complete with 2 x 18” bass drums, 5 x tom toms (3 x 10” toms, and 2 x 12” floor toms), a 12” snare drum, 3 x 13” cymbals, and a 13” hi-hat. 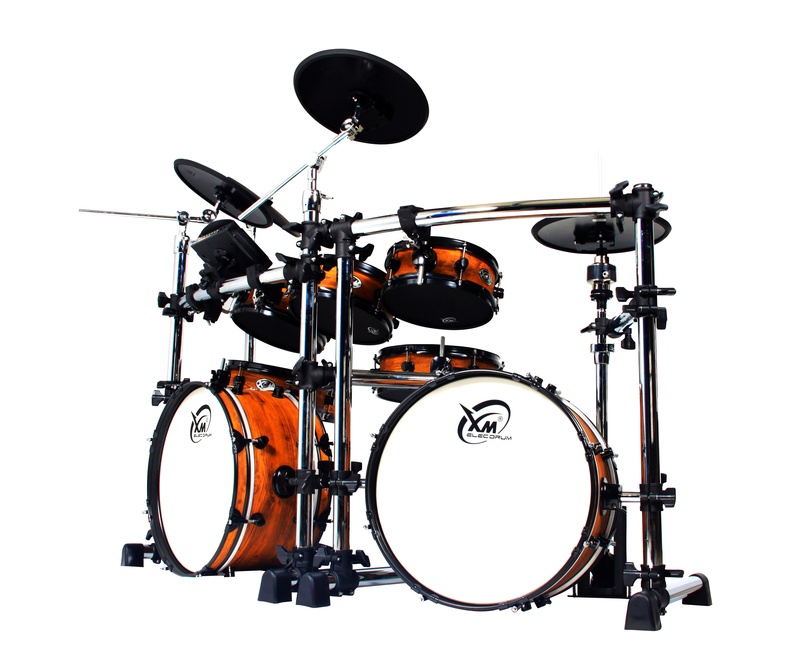 It has 3 crossbars in its rack system, and like a real double bass drum kit, the hi-hat is attached to one of these crossbars for extra stability. There are enough ports in the drum module to add 2 more drums/cymbals if desired, which would bring your e-Drum kit’s total to 14 triggered instruments. 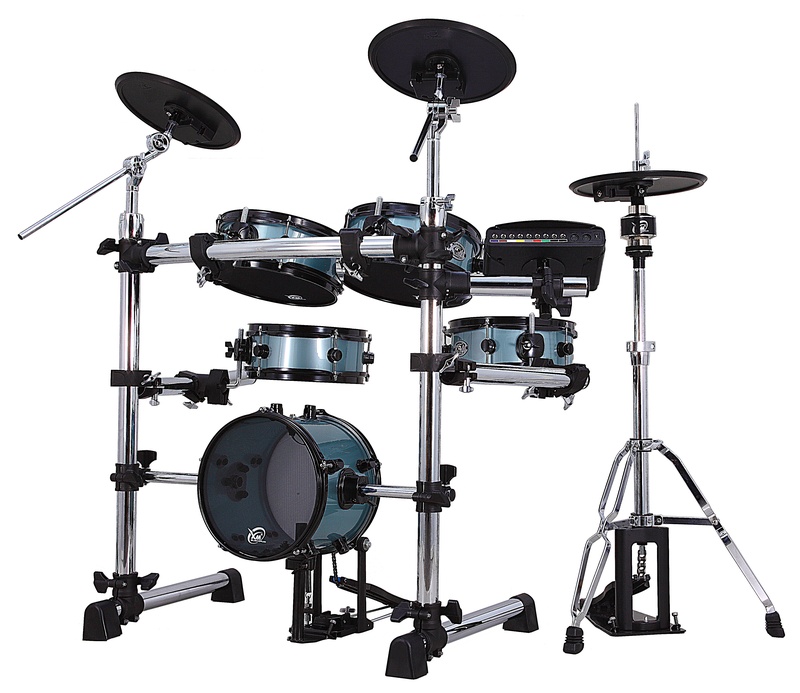 All XM E-drum sets come with the bass drum connected to the unique XM Rock Steady Bass Drum System to ensure it never moves, even with double bass drums attached to the rack crossbar. Have you ever seen an Edrum kit that looked this awesome? We don’t think so. The full touchscreen drum module sits in the middle of the kit, behind the smaller tom toms for easy access. This drum module can download Wav files of your favourite drum sounds (or any other sound for that matter) from a PC, which is then transferred via special XM software. This drum module also includes a fully adjustable metronome covering all the major drum time sequences. All the drums and cymbals, except for the bass drums (which don’t need more than one), have two dual triggers, which can create 3 sounds on a snare or tom, or 3 sounds plus a ‘choke’ on a cymbal. The hi-hat has been created with its own trigger system to provide many more realistic sound options. For example, the snare drum can be hit in the centre on the drumhead, on the edge (hoop), or you can hit both together in a ‘rim shot’. This goes the same for all 3 tom tom drums. The cymbals can be struck on the bell, the surface, the edge, or you can choke the edge. The XM digital hi-hat’s special triggered controller can read 4 different heights, so you can set it for closed, ¼ open, ½ open, or fully open. However, these hi-hats can be adjusted between 80 different levels, so if you desire you can set fully closed for slightly open, or fully open as still slightly touching. Different drummers like varied hi-hat sounds, so we’ve done our best to offer as many options as possible. You can hit the surface, bell, or choke, but of course there is no edge sound. This top-level e-Drum hi-hat system can also do ‘foot splashes’ with your heel! Real touch, real look, real sound: The XM Master Series Edrum kits truly replicate an acoustic drumming experience. What can you do with the e-Drum kit’s sound? First of all, there are 8 built-in drum kits to work with: Rock, Jazz, Pop, Dance, Funk, R & B, Metal and Percussion (congas, bongos etc.). However, you can mix any of these sounds into a single kit, as well as other sounds you’ve downloaded from your PC’s Wav files. This is only the beginning. Each drum and cymbal can faithfully reproduce hits that range from very soft to extremely hard. This is not simply amplifying the same sound (as is done with many other e-Drums like those at Yamaha), but the tone itself changes its nuances of skin texture and reverberation (in Rock and Jazz functions). You can also manually change the individual tuning of each drum’s sound. Getting excited? All XM e-Drum sounds are recorded from real drums, with each drum kit having varied sounds. The XM Master Series C-MAX-9SR is top of the line, so drum sounds are of DVD quality, and originate from the best acoustic drum kits in the world. This kit comes with 2 bass drum pedals, all necessary cables, as well as 1 pair of long maple wood drumsticks. We use ‘futuristic’ long drumsticks so you can easily move your hands from the base to the middle of the stick to change the hardness of your hits. If you want the ultimate e-Drum experience, The XM Master Series C-MAX-9SR is the e-Drum kit you’ve been looking for!